Rating: Everything just tastes great! My parents flew into town but their flight was four hours late so we needed to find dinner after 10pm. This can actually be a problem on the westside, but it turns out that Gjelina serves until midnight! Now Gjelina has gotten lots of rave reviews, and for good reason. It’s also one of our favorite lunch spots. They serve fairly casual fare, American with all sorts of influences, and most things are farmer’s market driven. The kitchen is just really good — so everything tastes great. The menu changes constantly. 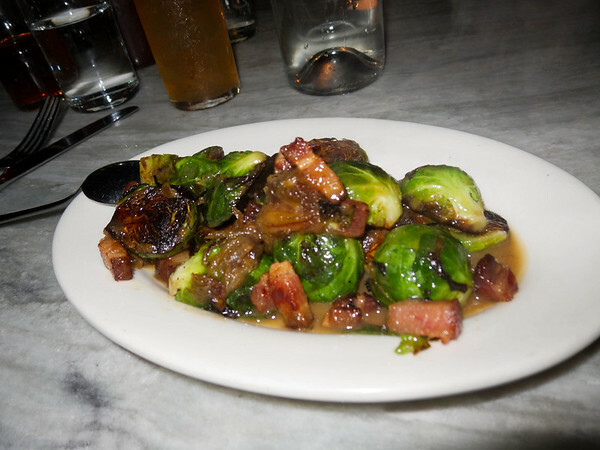 “Charred Brussels Sprouts with Bacon, Dates & Vinegar.” One of the things about Gjelina is that they can make even vegetables incredibly delicious — yes I’m a bit of a carnivore. These brussel sprouts aren’t bitter at all, and the thick chunks of smokey bacon (more pancetta really) are incredible. 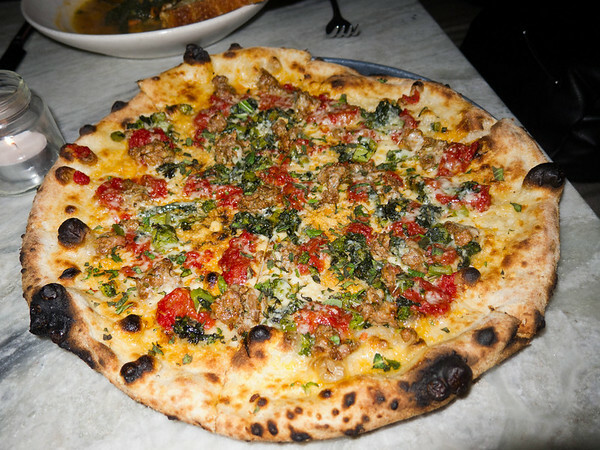 “Lamb Sausage, Conﬁt Tomato, Rapini, Pecorino & Asiago Pizza.” They make great pizzas too. These are very thin neo-neo Neapolitan pizzas baked very fast in a wood wire oven. The crust is very crispy, and there is a strong charcoal grill taste. This one has a nice cheesy, herby flavor offset with the very yummy lamb sausage. 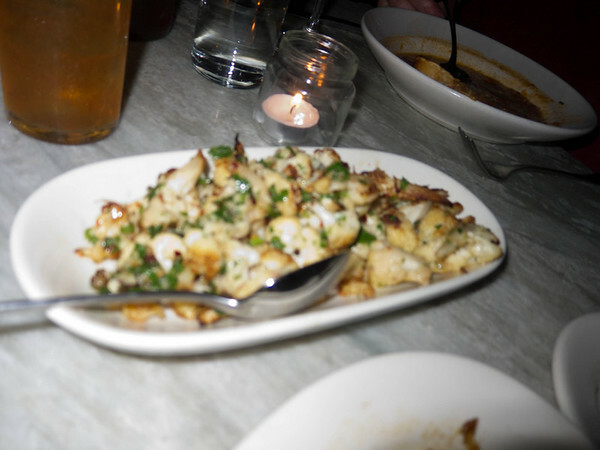 “Wood Roasted Cauliﬂower with Garlic, Chili & Vinegar.” Another example of the unusually yummy vegetables. This cauliﬂower has a nice double tang, vinegar and chili. Crunch Zing! 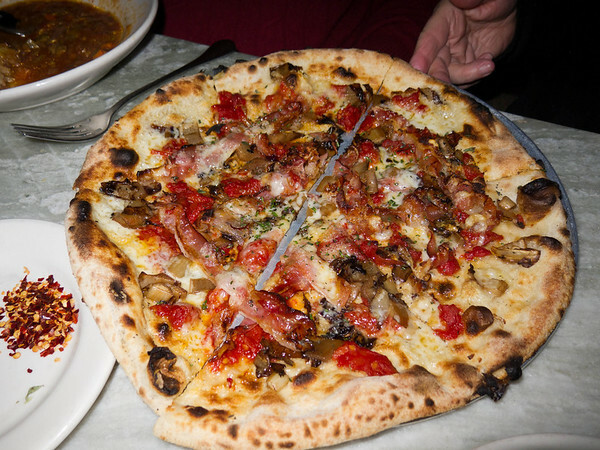 “Grilled Radicchio, Bacon, Fontina & Tomato Conﬁt Pizza.” Another great pizza. The bacon makes it of course. 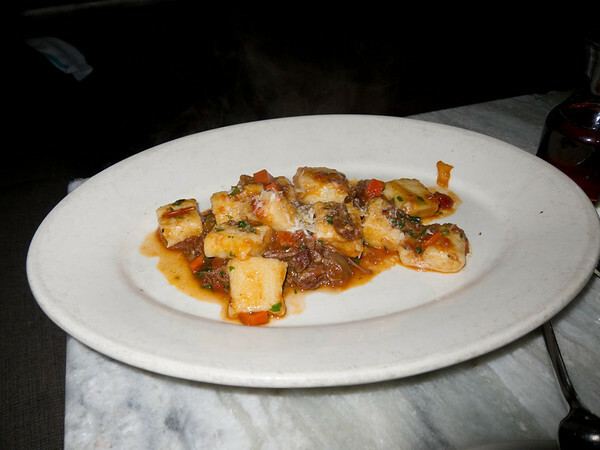 “Potato Gnocchi with a Short Rib Ragout & Pecorino.” Melt in your mouth. 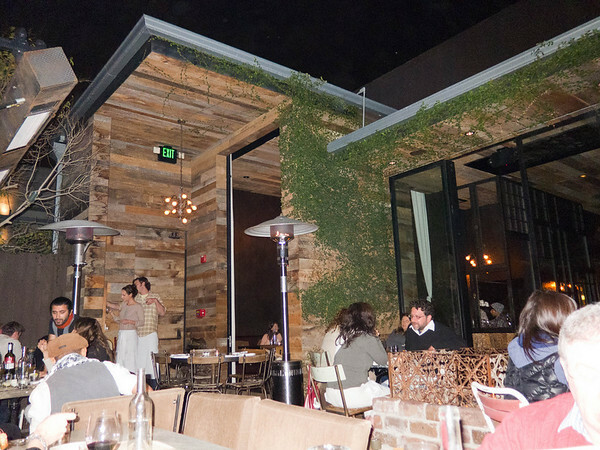 Inside they have both regular and communal tables, and outside they have a fantastic patio. It was pretty crowded at 11pm, with down tempo blaring on the speakers. Even on a chilly December LA night (roughly 50 degrees) the fire pit and heat lamp made me take off my jacket. 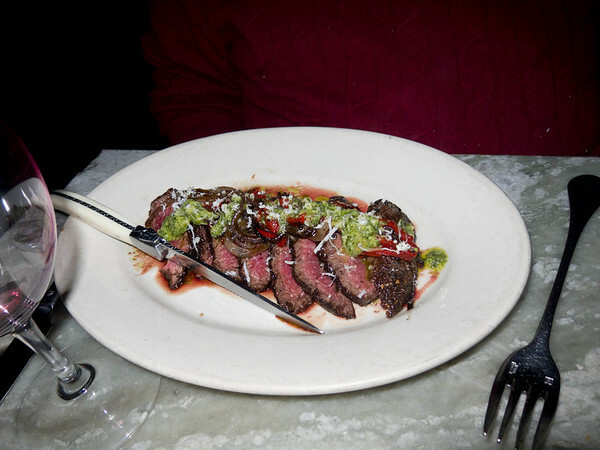 Serious LA ambiance — and food! 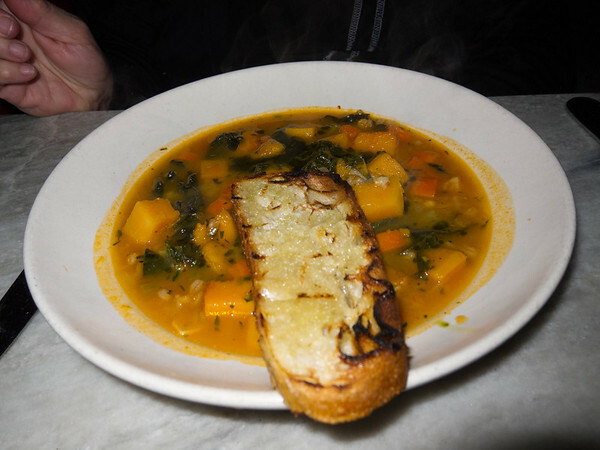 This entry was posted in Food and tagged Bacon, Brussels sprout, California, Cooking, Farmer's Market, Food, Fruit and Vegetable, Garlic, gjelina, Rapini, Restaurant, reviews, side dishes, soup, vegetarian, Venice.